FILE -- Travelers stand at an airline ticket counter at San Francisco International Airport on Jan. 26, 2015. 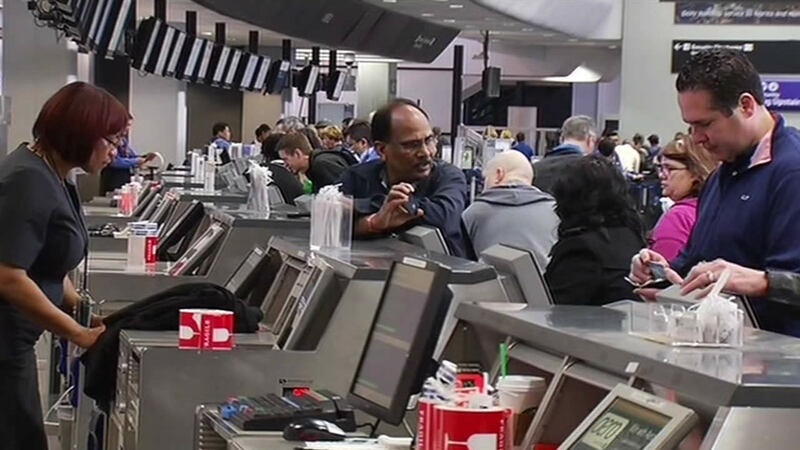 WASHINGTON -- A federal panel says airlines should clearly disclose the cost of change and cancellation fees, as well as the size of the plane's seats, before a passenger buys a ticket. The Advisory Committee For Aviation Consumer Protections also recommended Tuesday that hotels be required to include any mandatory resort or other fees in their room rates. Some hotels have begun adding mandatory fees to bills even though customers say they weren't informed of them when they booked their rooms. Likewise, the panel heard testimony that passengers must search to find the cost of change or cancellation fees that airlines hide in a ticket's fine print. The fees can run hundreds of dollars. Airlines have also shrunk the distance between seats as much as six inches in recent years.